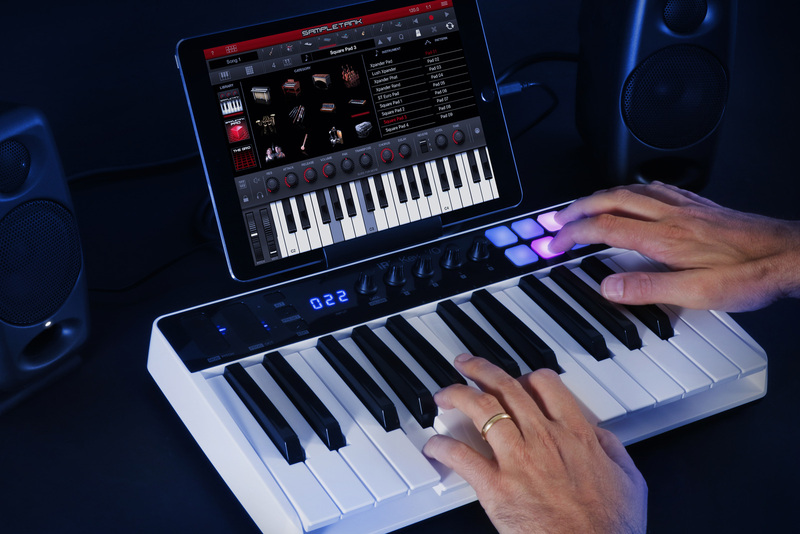 iRig Keys I/O 49 by IK Multimedia is a Mobile Audio App. The iRig Keys I/O series evolves the concept of traditional controllers as the only one available on the market that integrates 25 or 49 full sized keys together with a fully-fledged professional audio interface featuring 24-bit audio up to 96kHz sampling rate, balanced stereo and headphone outputs, plus a combo input jack for line, instrument or mic input (with Phantom power.). 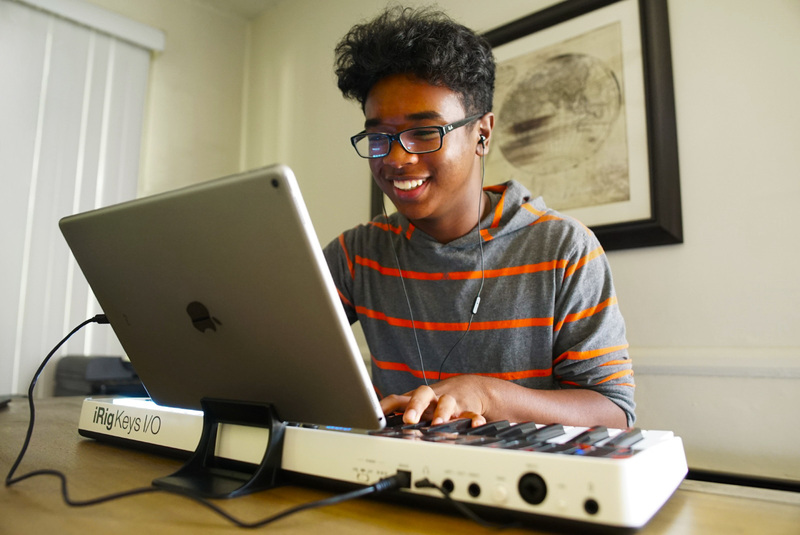 Being certified Apple MFi keyboard controllers ("Made for iPod, iPhone, iPad, ") iRig Keys I/O are guaranteed to work out of the box with all iOS devices including the latest generation of iPhone 7, that does not have an audio output, thanks to the on-board audio interface. The included Lighting cable allows for straight plug-and-play with Apple iOS devices, the USB cable connects Mac and PC computers. In a recording studio, everything can be connected directly to the keyboard ensuring the best possible quality with a Class A preamp for dynamic and condenser mics (including those requiring 48V Phantom power, which works under battery power as well, ) to line instruments and even Hi-Z guitars and basses. 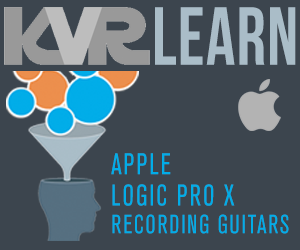 The built-in headphone output allows for convenient silent playing when studying or practicing. 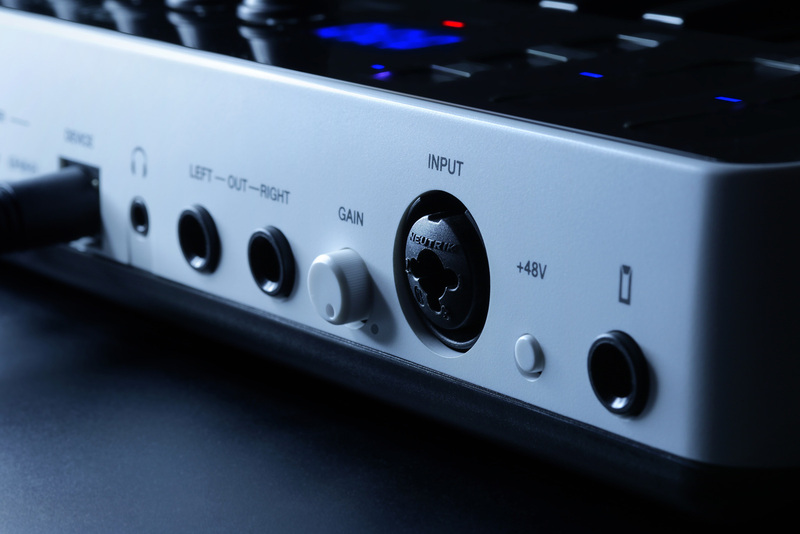 Plus, when used in live performances the balanced stereo output allows for long cable runs directly from the keyboard to the PA or mixer which is useful for performing keyboard players or DJs. All of this makes iRig Keys I/O controllers the ideal creative center of your studio or live performances, in any situation, providing a convenient solution even more affordable than having to buy a controller and an audio interface separately, that is simply unrivaled in today's market. 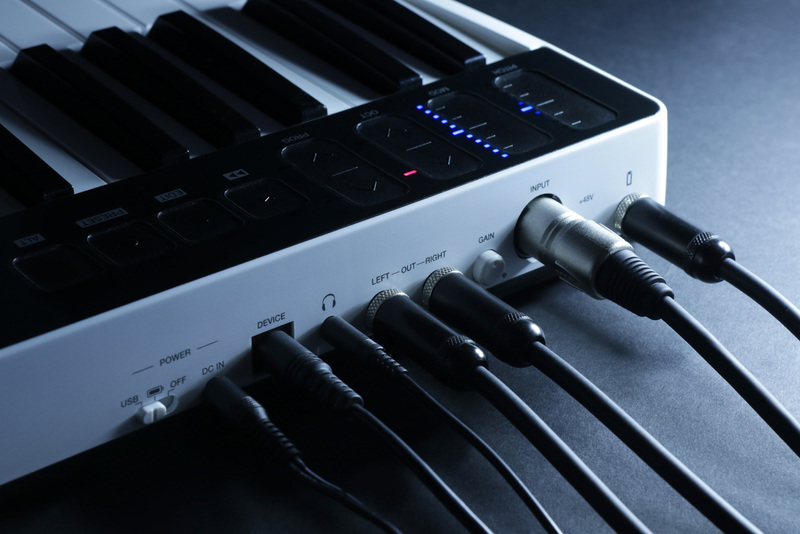 Despite their ultra-compact dimension, iRIg Keys I/O include all the tactile controls you would expect from a fully-fledged controller and more. Starting with a fast synth-action key bed that improves on all preceding IK keyboards and it's a joy to play. Both the models feature one volume/ data push knob, 4 touch sensitive knobs on 2 banks (acting as 8 total controls) and 8 multicolored, velocity sensitive pads. 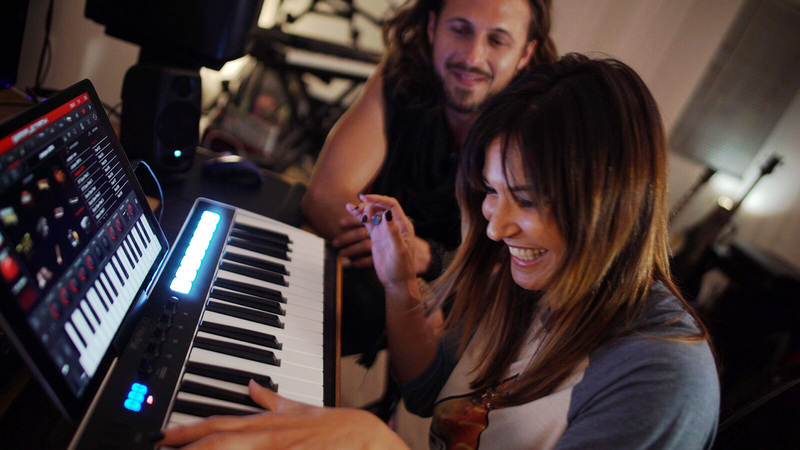 Plus, there are 2 fully programmable touch control strips acting by default as Pitch and Mod controls allowing for dramatic performances in any genre and double as fully programmable sliders. The fact that they are also the only keyboard controllers that work on AA batteries make them an ideal solution for mobile mini laptop computers where the USB port can't supply enough current to power the keyboard. 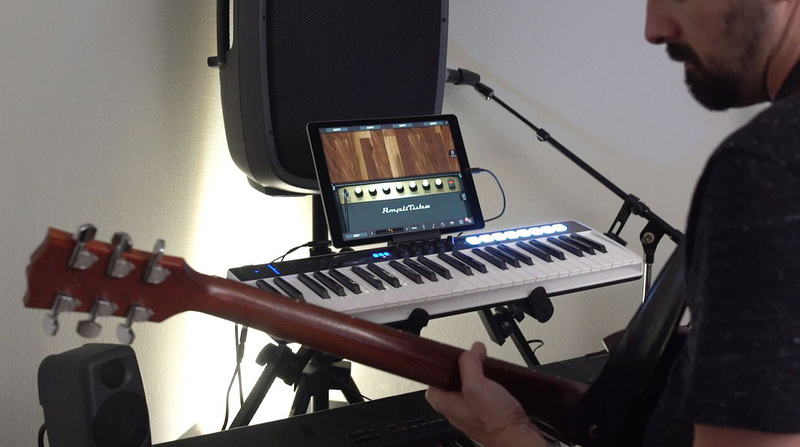 Musicians working on multiple devices will also find iRig Keys I/O the most convenient solution for bridging their work across multiple platforms by using the same controller. 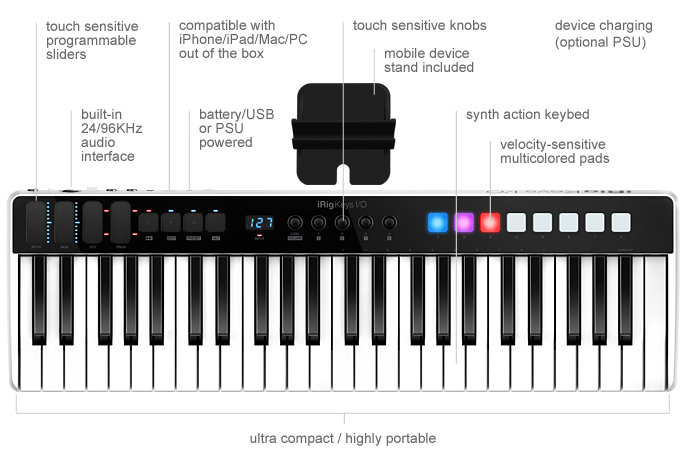 Plus, iRig Keys I/O can't be beaten for the traveling musician, not only for their minimal dimensions but also because they are 25% lighter than the lightest competitor. There is also a convenient travel bag available (sold separately, ) for both models. 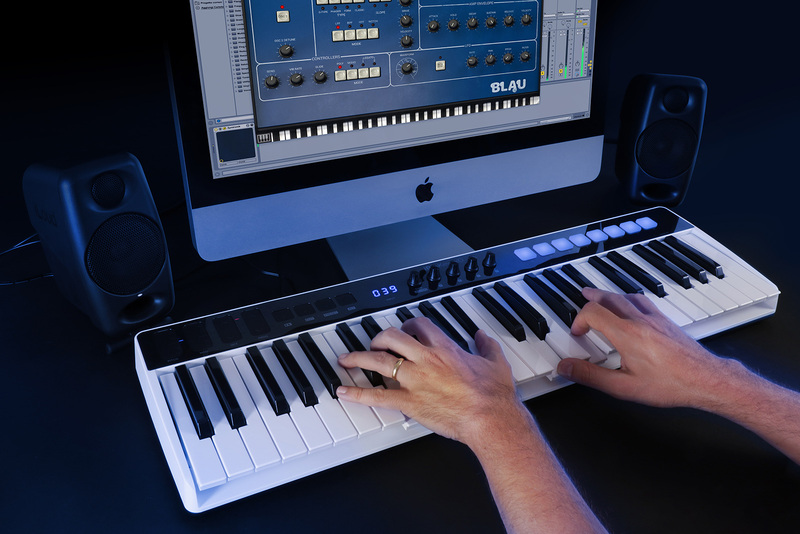 iRig Keys I/O comes with the largest selection of software and apps amongst any comparable controller. 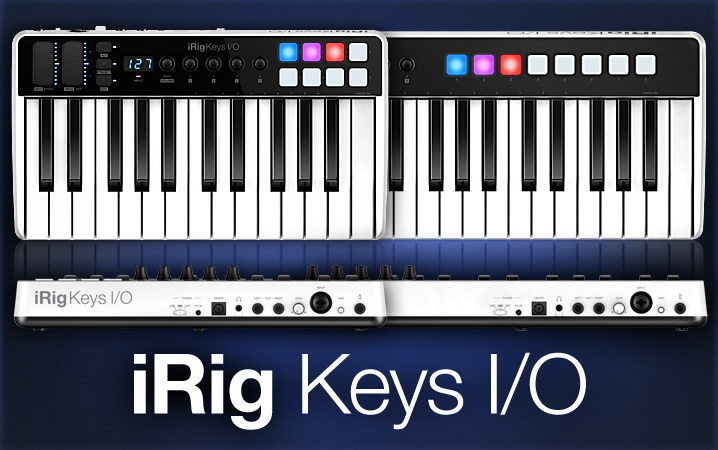 While reduced or light versions of software are generally bundled with other controllers, iRig Keys I/O includes a staggering quantity and value of full software. 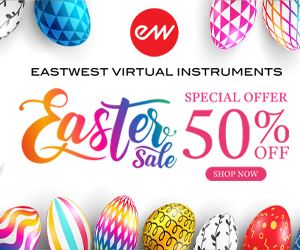 Starting with the full version of SampleTank 3 sound and groove workstation, T-RackS 4 Deluxe mix and mastering suite, Syntronik Pro-V vintage synthesizer and Miroslav Philharmonik 2 CE* orchestral workstation for Mac/PC, iRig Keys IO includes 13 full plug-ins (3 instruments and 10 dynamic and EQ audio processors), over 5,000 sounds and 43 GB of samples, that is roughly ten times more than the closest competitor. 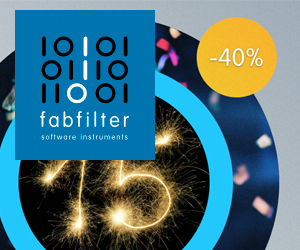 Plus, for iPhone and iPad users the full version of SampleTank and Miroslav Philharmonik Mobile Edition collection* are also included for a staggering value of $/€750 (49 keys version) and over $/€550 (25 keys version.) Just add your preferred DAW or a powerful free composing tool like GarageBand and make entire compositions in any music style (acoustic, electric, electronic) and any genre right out of the box. Works right out of the box with popular Digital Audio Workstation (DAW) software like Ableton Live, Studio One, GarageBand and Logic. 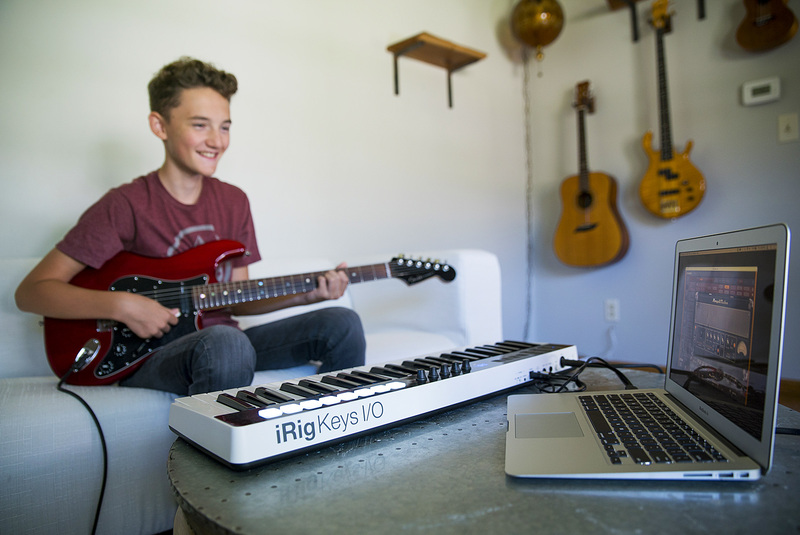 iRig Keys I/O is the plug-and-play production solution that sets up easily taking the time and worry out of configuring multiple devices, simplifying your setup and allowing for more focus on creativity. All-in-one, fully portable, ultra-compact MIDI controller with 24-bit / 96kHz capable input/output audio interface for iPhone, iPad, Mac and PC. 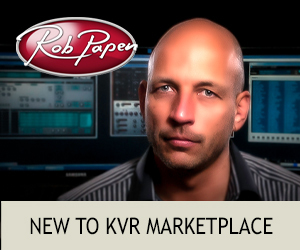 Available in 49 or 25 keys versions with full size keys and smooth, velocity-sensitive, synth-action keyboard. MFi certified by Apple ("Made for iPhone and iPad") includes Lightning Cable. Includes mobile device support stand. 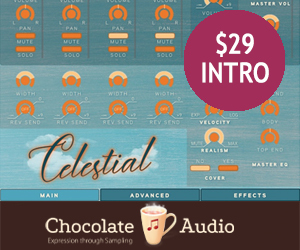 Comprehensive controls: 2 slider strips for pitch and modulation (user programmable, ) octave, program change and transport controls, 5 programmable touch sensitive knobs, 8 velocity-sensitive multi-colored assignable pads. Neutrik combo input jack for line, instrument or microphones. 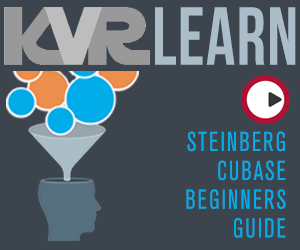 Balanced stereo and headphone outputs. Powered by USB, 4 AA batteries or optional external power supply (charges your iOS device). 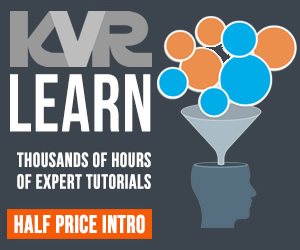 Comes with the most comprehensive collection of software instruments and pro studio processors on the market: a value of over $/€ 550 (25-keys model) and $/€ 750 (49-keys model) for software and apps.